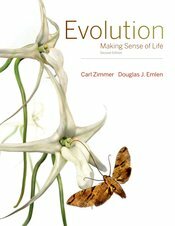 Science writer Carl Zimmer and evolutionary biologist Douglas Emlen have produced a thoroughly revised new edition of their widely praised evolution textbook. Emlen, an award-winning evolutionary biologist at the University of Montana, has infused Evolution: Making Sense of Life with the technical rigor and conceptual depth that today’s biology majors require. Zimmer, an award-winning New York Times columnist, brings compelling storytelling to the book, bringing evolutionary research to life. Students will learn the fundamental concepts of evolutionary theory, such as natural selection, genetic drift, phylogeny, and coevolution. The book also drives home the relevance of evolution for disciplines ranging from conservation biology to medicine. With riveting stories about evolutionary biologists at work everywhere from the Arctic to tropical rainforests to hospital wards, the book is a reading adventure designed to grab the imagination of students, showing them exactly why it is that evolution makes such brilliant sense of life.